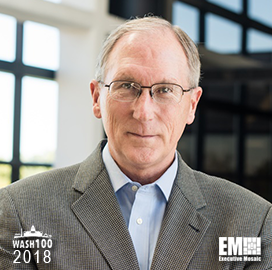 Executive Mosaic is pleased to announce that Larry Prior, President and CEO of CSRA, has been elected to the 2018 edition of the Wash100 — Executive Mosaic’s annual selection of the most influential voices in the government contracting arena — for driving key acquisitions in the IT space and overseeing the company’s $9.6 billion-buyout. 2018 marks the fourth consecutive year that Prior has been selected for the Wash100. Prior has led the Falls Church, Va.-based services provider since its November 2015 separation from Computer Sciences Corporation and merger with SRA International to form CSRA. 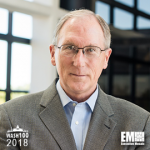 Under his stewardship, the company became a primary broker and systems integrator for federal agencies seeking to modernize their digital infrastructure, cloud computing and data analytics. To that end, CSRA pursued an aggressive growth strategy, completing its acquisition of NES Associates in July 2017 and announcing plans to acquire Praxis Engineering last October. Most importantly, Prior oversaw the Feb. 12th-announced buyout of CSRA by General Dynamics for $9.6 billion. “We believe that this combination creates a clear, differentiated leader in the federal IT sector, with a full spectrum of enterprise IT capabilities, including unique depth in next-gen offerings in conjunction with our commercial IT alliance partners,” said Prior in the release. GD’s chairman and CEO Phebe Novakovic, a fellow 2018 Wash100 inductee, believes the move enhances her organization as an IT platforms provider and extends its client base in the intelligence, defense and federal civilian sectors. She projects the combined company will see $9.9 billion in annual revenue. For his achievements, Prior received the Northern Virginia Technology Council’s Tech Executive of the Year in December. He is a member of The Wall Street Journal’s CEO Council, which features over 150 of the world’s top CEOs and high-ranking executives, and was named a Board Leadership Fellow by the National Association of Corporate Directors last summer. Executive Mosaic congratulates Larry Prior and the CSRA team for their selection to receive this award.